Energy Master Home uses numerous scientific testing instruments to test your whole house during a Whole House Energy Analysis: blower doors, duct blasters, tru-flow meters, manometers, infrared thermometers, infrared cameras, amp meters, thermometers, low-e detectors, moisture and humidity meters, velometers, flow-hoods, etc. to accurately test and measure everything in your home that could cause poor energy efficiency, comfort and health problems. We can test and measure your home efficiency with our blower doors and infrared to find out where and how much it leaks. We can test and measure your duct design to find out where they leak and whether they are the right size with the right air and whether they have enough insulation. We can determine if vents would be more comfortable with different grills or placement. We can test and measure every room in your home to determine exactly where you have uncomfortable areas in your home. We can test and measure all of your insulation levels (ceilings, walls, and floors) to determine their efficiencies. We can test and measure all of your windows and doors to see if they are leaky, do they have low-E protection, should they be replaced? Other tests and measurements we take can determine the cause of almost any problem in your home, from sweating windows to high utility bills. We can’t offer our home energy consulting service for free, but we can make an even better offer. We can offer you a “Whole House Energy Analysis” that actually works and saves you money. There is no guess work and our solutions are guaranteed. Their energy audit is free, but their advice does not work. As a result you throw away good money after bad and still have the same problems. What’s “free” about that? We actually solve your home energy problems the first time, saving you money every month from now on and making you and your family healthier and more comfortable from now on. That’s better than “free energy audit”…it’s a money maker! Lower utility bills, potentially lower health bills, a more durable home with a higher level of comfort. Now that is a solution! You wouldn’t want a doctor to diagnose appendicitis based solely on your complaints of a stomach ache (your symptoms). Scheduling an operation based on pure guesswork would be considered ludicrous. Instead, doctors rely on the latest in medical technology to provide them with valuable information in the diagnosis and decision-making process. Similarly, you wouldn’t want someone guessing why your energy bills are so high or your home is so uncomfortable. Advances in building science technology have led to a new tool to help diagnose the real causes for high energy bills and uncomfortable homes. The Blower Door testing for home air leakage is a specially built, calibrated device that is used to identify the overall air leakage of a home and its Heating and A/C duct system. By depressurizing the entire house, specific leakage areas can be located. The Blower Door consists of a large fan which is mounted in a frame. The frame is placed in an exterior door and used to calculate the leakage of the house and the Heating and Air distribution ductwork. Home air leakage and duct leakage can have a significant impact on the heating and cooling costs of a home as well as the overall level of comfort. Homeowners are always amazed at what they learn about their homes during a blower door test. Home air leakage sites are identified, the total air change rate of the house is determined, duct leakage is measured and located, and moisture, humidity, mold and mildew problems can usually be traced to their source. Blower door testing greatly enhances our view of the whole house as a interactive system, a complex interplay of temperatures, humidity, air movement, convection and forced-air pressures generated by the air handler of the central duct system. Blower door testing also allows us to calculate your home’s unique heating and cooling loads in order to accurately size your heating and air equipment (rather than guessing or using some industry “rule-of-thumb” like most heating and air contractors). The homes that we live in are susceptible to the quality and performance problems created during the building process. Excessive energy use, moisture problems and poor heating and air conditioning distribution and performance are a few of these problems. The trouble with these problems, usually created by poor design, construction and maintenance of the home, is that they are difficult to diagnose and resolve. 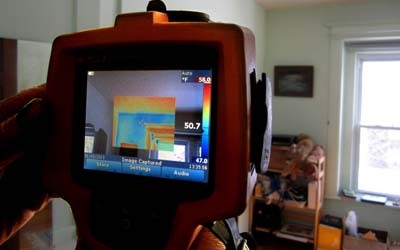 At Energy Master Home, Inc. we use building Thermal Imaging analysis, or Infrared, to provide remarkable nondestructive information about the construction details and building performance of your home. Our building Thermal Imaging provides a means of seeing invisible thermal signatures related to the inefficient problems of your home. Excessive air leakage can account for up to half of the energy consumed to conditioned buildings. Missing, damaged or non-performing insulation will stand out clearly in a thermal image. Thermal Imaging will make visible the impact that duct leakage and poor performance in the duct work may have causing hot and cold spots. This remarkable technology gives Energy Master the ability to make visible the otherwise invisible problems in your home. Along with the other components of our Energy Audit, we are able to diagnose the tough problems that, left unsolved, will cause continued high utility bills and comfort problems. Thermal Imaging is just another way Energy Master is “Solving Problems, No One Else Can”.